In keeping with the theme of amazing products that we purchased and then never got a chance to use, we are putting the headers we spec'd for the Revolution up for sale. Back when we had a supercharged application I firmly believed that these were the best headers you could get for the purpose. Not as expensive or big as CMI's and designed to be durable enough to be moored in saltwater. The entire header is jacketed by a water manifold, so it is much cooler inside the boat and it even comes with a built in replaceable sacrificial anode. We are only switching because the twin turbo setup doesn't use headers and comes with manifolds. They are a direct replacement for Merc big blocks from what I understand. 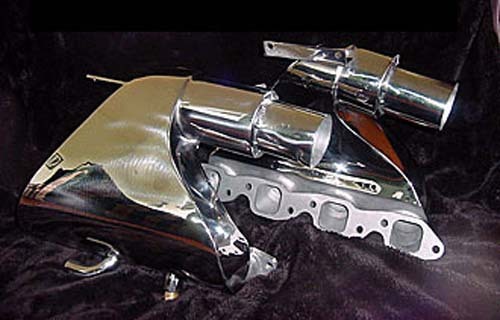 They are polished stainless finish. Ours don't have any bracketry as we weren't going to need it. I had to import these, and as such I paid the tariff and tax from customs. I will sell them for what we paid as a prospective OEM... They have a 5 year warranty on them. Asking $2,000 OBO. Fire it up for summer folks!!!! You don't have one of your boats laying around that you decided not to use do you? The other side of that though is I don't want to pay what you have put into it cuz with, material, time, R&D, beer etc.... since you have started this endeavor I doubt I have enough in my piggy bank. For the merc/chevy it says 5-7.4 litre. That is likely inaccurate. I know that small block headers are different than a big block. They are nice. I have the same set (not polished) on my boat. Hope to keep them for at least 10 years. My eyes cannot decieve me. One reason I bought them. Try to find anything besides cast iron Osco's for a Mopar. After three months with no luck I broke down and spent the money. As for the motor, everything costs more but its one of the best motors I have ever built.